Senator Winters (R-Salem) is a premier example of servant leadership. Salem, OR. 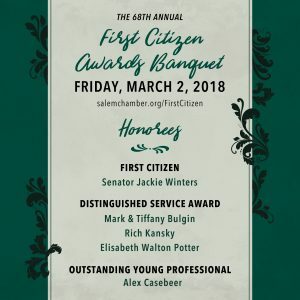 – Since 1950, the Salem Area Chamber of Commerce has hosted the First Citizen Awards Banquet to honor the history of Salem and the individuals who have helped shape the community to what it is today. This year, the Salem Chamber Nomination Committee selected an elected official for the First Citizen Award. Senator Jackie Winters is a pillar in the community and was elected to the Oregon State Legislature in 1998 as the state’s first African-American Republican. Along with Senator Winters, the Salem Chamber announced Distinguished Service Award winners Mark and Tiffany Bulgin of the IKE Box, Rich Kansky of Green Acres Landscape and Elisabeth Walton-Potter, a champion for a more creative Salem, and Alex Casebeer of Capitol Auto Group as the Outstanding Young Professional. Nominees and winners are not always Chamber members, making the award representative of Salem. 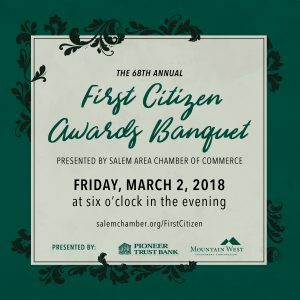 Please join us as we honor all award winners at the Salem Area Chamber of Commerce 68th Annual First Citizen Awards Banquet, presented by Pioneer Trust Bank and Mountain West Investment Corporation, Friday, March 2, 2018 at the Salem Convention Center. Don’t miss this historic event; tickets are available at salemchamber.org/firstcitizen. The Salem Area Chamber of Commerce is a privately-funded 501(c)(6) not-for-profit membership organization that advocates for business, community and economic prosperity. The Salem Chamber represents over 1,000 businesses, who employ over 50,000 Oregonians in the Mid-Willamette Valley. Led by a volunteer board of directors, the Salem Chamber is dedicated to sustaining Salem’s quality of life, and keeping the community and economy vibrant. To learn more about the Salem Area Chamber of Commerce, please visit https://salemchamber.org.